ENJOY SUNSET AT WAKA BAR & RESTAURANT - The vibes of rustic, open air and wooden texture have become the strongest points at Waka Bar & Restaurant, the elevation of the restaurant make the sound and the wind of the sea freely as a natural refresher if you decide to enjoy your breakfast, lunch even dinner in the restaurant. Surprisingly, when I was there, there was table booked for dinner more than breakfast & lunch, and I will tell you why. The atmosphere of Yeh Gangga Beach was so great, I still remember how it feels. I thought the smell of the air would be salty, but when I was there, it’s not. The sky is bright, and the wind was cooler, I was looking one or two trying to rules the waves with their surf boards. I asked the staff lady on the restaurant, “The waves look very dangerous, but can I swim there?”, unfortunately, the answer is no, she keeps telling me that I need to stay away from the beach, but if I want to enjoy the beach and have some walk, wait until the sunset time, you still can’t swim but who can resist the scenic beautiful beach on the afternoon waiting for sunset. I can’t say much about the breakfast, because it’s only a few menus to choose, but it's definitely #BreakfastWithaView and I can recommend you to try Indonesian breakfast, Nasi Goreng or Mie Goreng, but one tip from me, if the rice was newly cooked, it wasn’t really suitable for Nasi Goreng, so you may choose the Mie Goreng instead, believe me, you will like it. So, you need to ask the restaurant staff (where ever you order a plate of Nasi Goreng) if the rice is newly cooked or not? Because for me personally, the great Nasi Goreng is a bit much drier than the newly cooked rice which still had it's moist. To take everything up, don't forget to try their signature Balinese Coffee! THE DRINKS?, I cannot try all their mocktails on the menu, but maybe you can. Their drinks are essentials mixing, I believe I have ordered something similar, like common orange with pineapple, or pineapple with lime, you know the mixture that creates fresh and delicious drink? 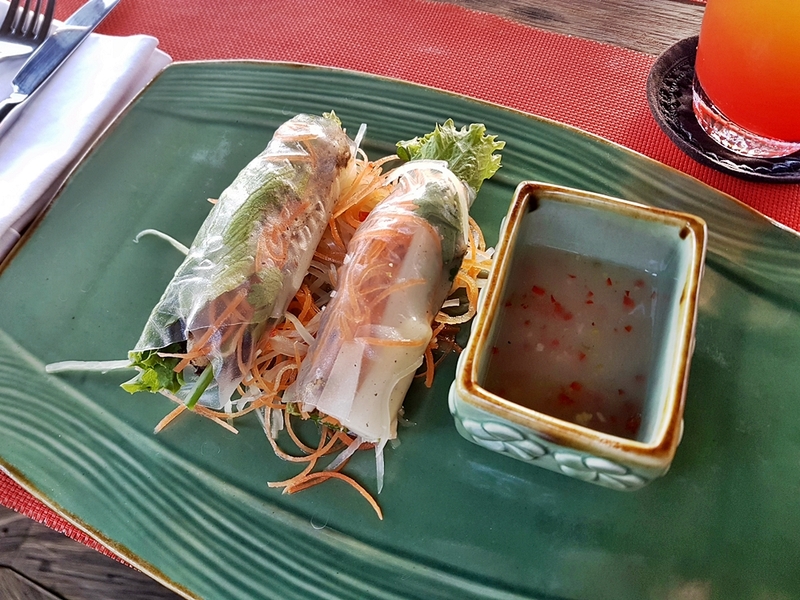 You can try their signature Kecak or Barong for your fresher sunny day and do-nothing Afternoon at WakaGangga Resort & Spa, with a full pan of pizza and Vietnamese chicken rolls (my life is complete, with those chicken rolls). Dinner was also an awesome experience, there was a walk-in family, some couples, and of course me that shared that night together at Waka Bar & Restaurant. 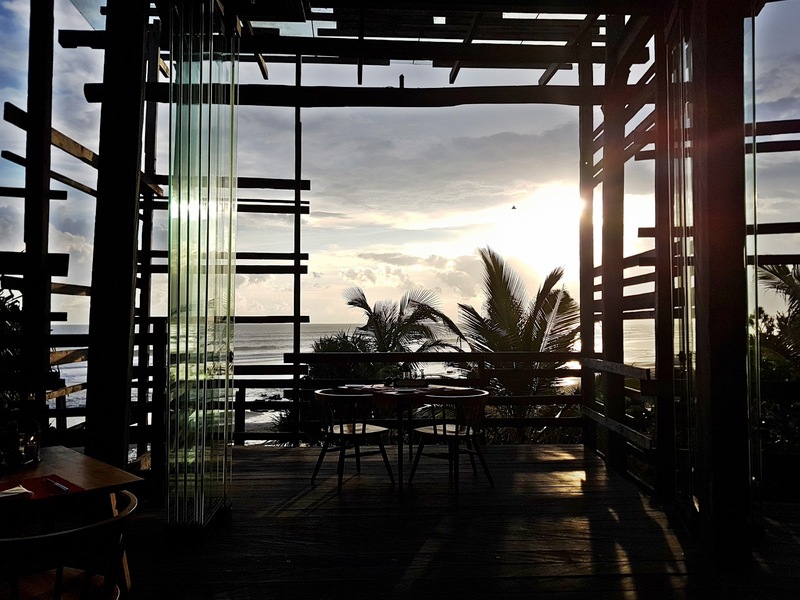 I seated close to the beach side, even though it was dark as far as the eye can see, and then I realized that Waka Bar & Restaurant also have minimum lights, with dim light and glimmers vibes. I know the reason why, it was to tone down your sense of sight (or even other senses) and maximize your sense of taste, and it worked that night. That probably my best duck meat I ever tasted. 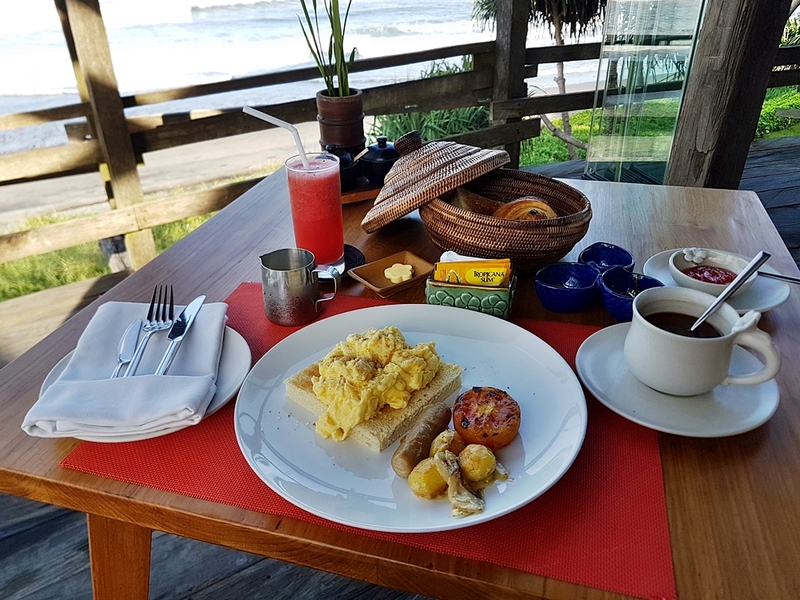 I mean, it’s quite different to taste a delicious dinner, in high rise building with the same glimmer atmosphere and classical music, compared with open air restaurant next to the Yeh Gangga Beach in Tabanan and sound of the night sea. Unfortunately, I don’t want to disturb other guests that night, with my camera blitz, so I only take 1-2 shots and enjoy the plate. 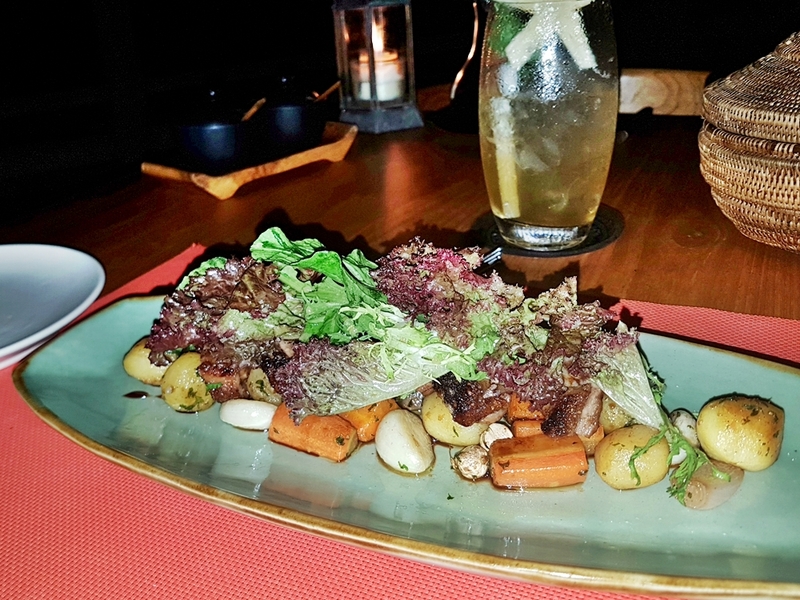 Unfortunately, they had to plate it like a salad, but the juicy, sweet and tasty duck meat underneath the bunch of vegetables was divine. 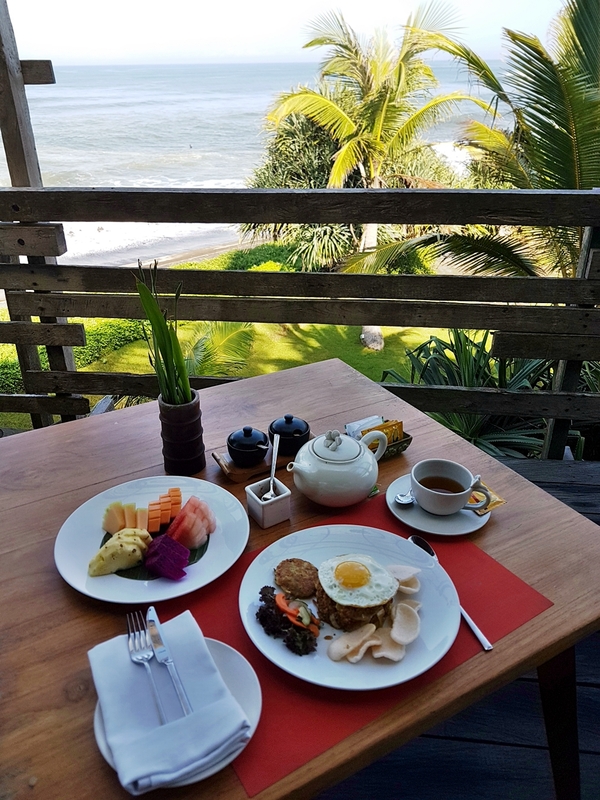 Wait for me to come back to WakaGangga Resort & Spa for beautiful sunset at Tabanan coast line at Yeh Gangga Beach and continued with Honey Glazed Duck Breast with Root Vegetable and Herbs Lettuce and enjoy the night time at Waka Bar & Restaurant.